Everyone is familiar with the many members of the Dinosauria (Heterodontosaurus, Coelophysis, Saturnalia, for instance), the preeminent denizens of the Jurassic and Cretaceous eras. Unfortunately, the origin of the Dinosauria has been left in the shadows, miscast and muddled with taxa that do not belong in the dinosaur lineage. Figure 1. The traditional model of dinosaur origins, based on Nesbit (2011). No problem with the three dinosaurs. No problem with the two dinosauriforms. A little deeper into the lineage problems arise. It’s easy to see how Euparkeria could give rise to Ornithosuchus, but Parasuchus, with its elongated rostrum and displaced nares, does not belong here. Following giant Ornithosuchus (with small lateral fingers) comes the relatively tiny pterosaur, Dimorphodon, with hyper-elongated finger #4. Pterosaurs don’t belong here either. This lack of a long finger #4 in the immediate sisters proposed for pterosaurs is a “red flag” discussed earlier here. Lagerpeton does not belong here either. See below. The heretical model (Figure 2) employed many more taxa, which provided many more possible nesting sites. It recovered a family tree that had fewer untenable reversals and one in which all sister taxa more closely resemble one another. Here, the basal rauisuchians Vjushkovia and Decuriasuchus, were basal to both crocodylomorphs, like Pseudhesperosuchus, and basal dinosauromorphs, like Turfanosuchus and Trialestes). All these taxa more closely resemble one another and none have wings or displaced nares. Pterosaurs do not belong in the lineage of dinosaurs. All dinosaur sister taxa have reduced the lateral digits, #4 and #5 on the manus and #5 on the pes. Pterosaurs have a hyper-elongated manual digit #4 and a long pedal digit #5, as in other fenestrasaurs. Pterosaurs do not have a mandibular fenestra and none have an antorbital fossa. Chevrons do not extend ventrally on pterosaurs, as they do in archosaurs. Extradermal membranes and an ossified sternum do not appear on archosaurs until the appearance of bird precursors. In Nesbitt (2011) pterosaurs nest close to parasuchians and proterochampsids because both share a displaced naris, but otherwise they share virtually no other traits in common, as is plainly obvious (Figure 1). Phytosaurs, like Parasuchus, and proterochampids, like Proterochampsa, Chanaresuchus, Tropidosuchus and Cerritosaurus were clearly sister taxa. However, neither clade shared very much in common with Euparkeria and Ornithosuchus, other than an antorbital fenestra, which was seen as a trait unique to one all encompassing clade, the Archosauriformes. Earlier we saw that the antorbital fenestra appeared in at least four separate reptilian clades. Phytosaurs and proterochampsids shared more traits in common with choristoderes and Doswellia, two taxa not typically employed in archosaur family trees, and all appeared here as pararchosauriforms, separate from the dinosaur lineage. Lagerpeton does not have the robust pedal digit 2 of Tropidosuchus, but other aspects of its foot and pelvis, for that matter, are nearly identical. Figure 3. Click to enlarge. 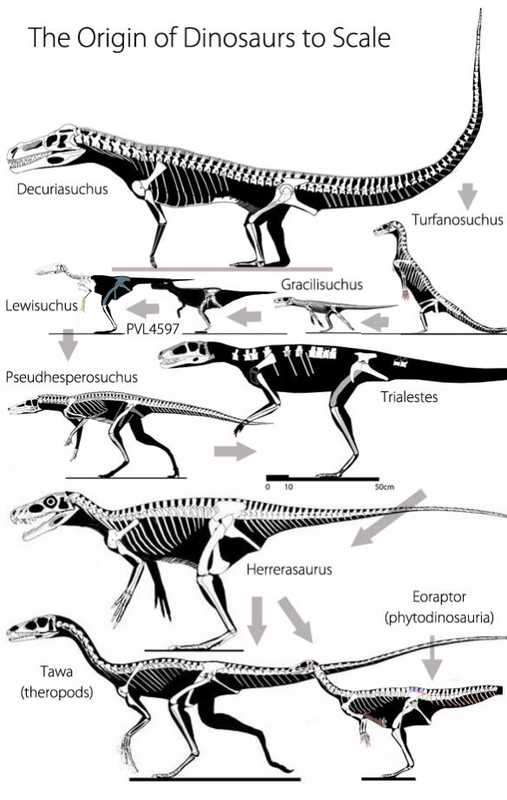 Lagerpeton compared to other pararchosauriforms, including Tropidosuchus and Chanaresuchus. Note added Aug. 1, 2012: BPI 2871 now nests with other Youngina specimens at the base of the Pararchosauriformes, not far from Doswellia and the Choristodera. Lagerpeton has been a traditionally included taxon in the lineage of dinosaurs, but a larger study indicates it does not belong there. It shares more traits with Tropidosuchus and Chanaresuchus. Lagerpeton, known only from the middle of the skeleton and hind limbs, had a longer pedal digit 4 than 3, but predecessor and successors all have a longer pedal digit 3 than 4. Tropidosuchus and Chanaresuchus share a long rostrum and displaced nares, like that of Parasuchus and Cerritosaurus. Most rauisuchians, like most crocodylomorphs, were clearly distinct from the lineage of dinosaurs — but the basal members were not so far removed. The Nesbitt (2011) study suffered from not including several basal crocodylomorphs which were closest to the origin of dinosaurs, aetosaurs, Ticinosuchus and Qianosuchus, which may be the reason for the nesting of Postosuchus with Hesperosuchus, which otherwise do not closely resemble one another. Nesbitt (2011) reported several “novel” findings that were early found in the large study. These include: (1) proterochampsians are monophyletic (i.e. included chanaresuchids). Unfortunately by not including several Youngina and Youngoides specimens and choristoderes Nesbitt failed to recover a tree in which proterochampsians nested far from Euparkeria on a separate lineage along with phytosaurs; (2) Gracilisuchus is one of the most basal suchians. 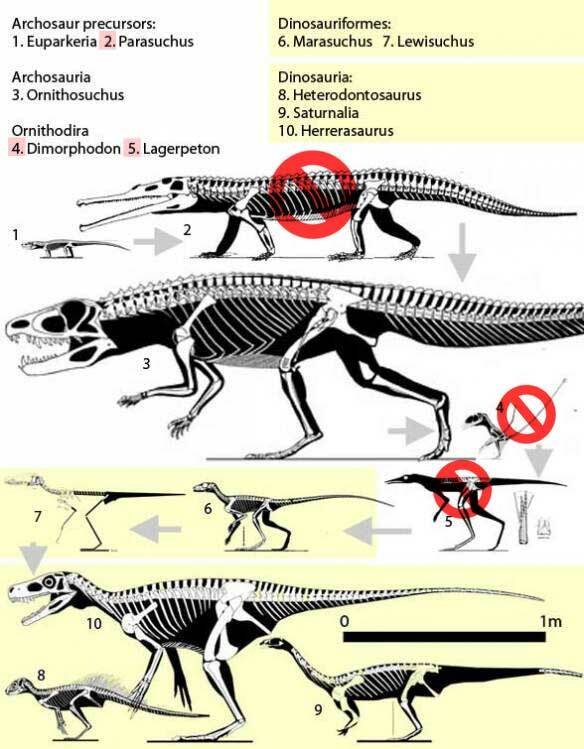 Unfortunately Nesbitt did not include other basal crocs, including Decuriasuchus, Pseudhesperosuchus, Scleromochlus, Saltopus and Saltopusuchus; (3) Rauisuchidae is recovered as monophyletic (but here the Rauisuchia also include the Archosauria); (4) ‘‘Silesaurs’’ are a monophyletic sister taxon to Dinosauria (actually, with the addition of Daemonosaurus, silesaurs are within the Dinosauria). Both studies nested Lewisuchus close to the base of the Archosauria and Marasuchus, a more complete biped at the base of the Dinosauria. In addition, Turfanosuchus nested with Gracilisuchus, Ticinosuchus and the Aetosauria in Nesbitt (2011)), not far from the base of the Dinosauria. (1) Phytosaurs are the most proximal outgroup to Archosauria; (2) Hesperosuchus and similar taxa are the basalmost crocodylomorphs (but that was only because Nesbitt removed a long list of even more basal crocs); (3) Crocodylomorpha is the sister taxon to Rauisuchidae (but the problem is Nesbitt nested basal crocs close to derived rauisuchians like Postosuchus. Other problems, like the nesting of Vancleavea with archosauriformes were discussed earlier. This entry was posted in Archosauria, bipedal, diapsids, dinosaur origins, dinosaurs, reptile family tree, Triassic and tagged Archosauria, Crocodylomorpha, dinosaur, dinosaur origins, transitional taxa by davidpeters1954. Bookmark the permalink.